: Hunting dog for birds and small animals. Companion dog. : The Shiba has been a native breed to Japan since the primitive ages. The word « Shiba » originally refers to something « small », a « small dog ». The Shiba’s habitat was in the mountainous area facing the Sea of Japan and was used as a hunting dog for small animals and birds. There were slight differences in the breeds according to the areas where they were raised. 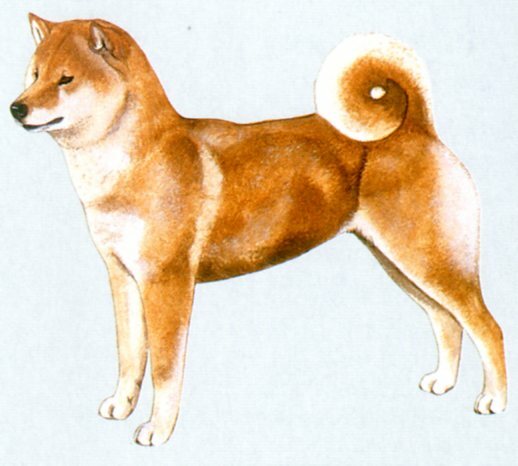 As dogs like English Setters and English Pointers were imported from England during the period of 1868-1912, hunting became a sport in Japan and crossbreeding of the Shiba with those English dogs became prevalent and a pure Shiba became rare so that by 1912-1926 pure Shibas confined to these areas became exceedingly scarce. Hunters and other educated persons became concerned with the preservation of the pure Shibas from around 1928 and the preservation of the limited number of pure strains began seriously, and the breed standard was finally unified in 1934. In 1937 the Shiba was designated as a « natural monument » after which the breed was bred and improved to become the superior breed known today. : Small-sized dog, well balanced, well boned with well developed muscles. Constitution strong. Action quick, free and beautiful. : The temperament is faithful, with keenness in sense and high alertness. : Well defined with slight furrow. : Black colour desirable. Nasal bridge straight. : Moderately thick and tapering. : Relatively small, triangular and dark brown in colour; the outer corners of the eyes are upturned. : Relatively small, triangular, slightly inclining forward and firmly pricked. : Thick, strong, and well balanced with the head and the body. : Set on high, thick, carried vigorously curled or curved as a sickle, the tip nearly reaching hocks when let down. : Seen from the front, forelegs straight. : Shoulder blade moderately sloping. : Digits tightly closed and well arched. Pads hard and elastic. Nails hard and dark in colour desirable. : Short, but well developed. : Outer coat harsh and straight, undercoat soft and dense; hair on tail slightly long and standing off. Red, black and tan, sesame, black sesame, red sesame. Red sesame Ground colour of hair red, mixture with black hairs. Urajiro: Whitish coat on the sides of the muzzle and on the cheeks, on the underside of the jaw and neck, on the chest and stomach and the underside of the tail, and on the inside of the legs.